Joana Vasconcelos' life-sized ''Happy Family'' (2006) on display at Garrett Street, Downtown Lisbon. Check her very cool site for a better understanding of her super creative work. Eu também estou muito impressionada com a beleza dessa sua foto nova do header!Vc é muito talentoso meu amigo! Feliz Natal e muito obrigada pelo carinho e amizade! Hoho, that is a different one! Vrolijk Kerstfeest to you too! A bit strange but why not ! Is this a display in the window of a store that sells lace? I have never seen anything like this. Ahh! Lovely. And a Very Happy Christmas to you. Beautiful and unique - artsy! I'm late, sorry JM, I hope you had a wonderful Christmas! Wow..this is far out! ha.. It is when I see how many bales of hay are stacked high around these sculptures that I realise the large size of the work. Merry Christmas, Jose. And may you look forward to a happy and healthy 2010. 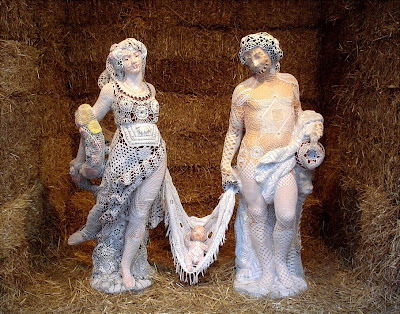 This is a creative show of the nativity of Jesus. Just beautiful laces too. Have a wonderful Christmas. Merry Christmas JM. Very interesting statue of the family. i will have to check out the artist's site. This is a most unusual nativity scene. The lace reminds me of sea foam and seems perfect to me for a coastal community. I hope you and your family had a blessed, wonderful and joyful Christmas, Jose!